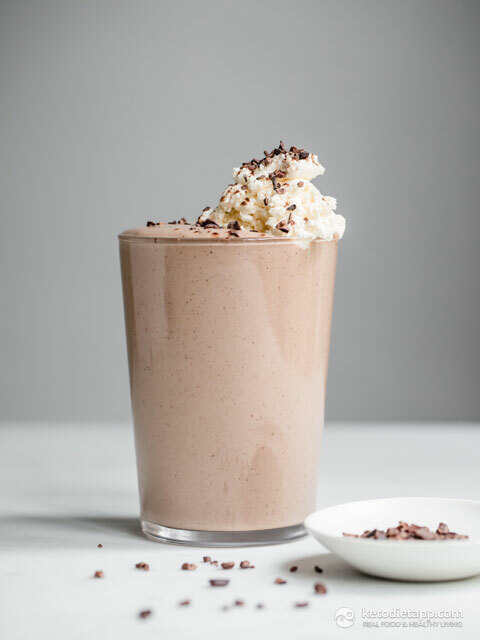 Low-carb smoothies like this chocolate coconut smoothie are a healthy breakfast option for busy mornings. Thanks to healthy fats from avocado and coconut cream, this keto smoothie will keep you full until lunch. Avocado and cacao are high in electrolytes, especially magnesium and potassium, and will keep keto flu at bay. 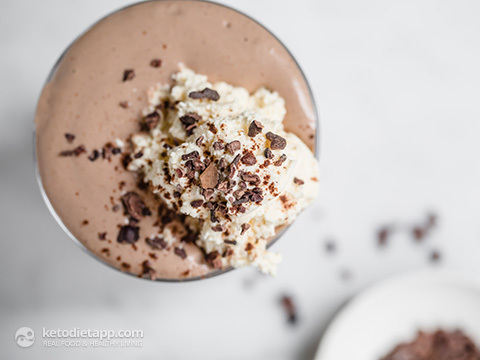 You can optionally add collagen, whipped cream and cocoa nibs. Enjoy! 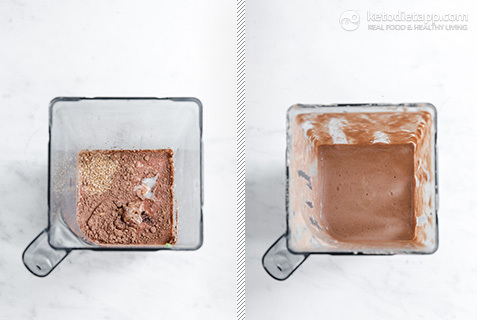 Place all the ingredients in a high speed blender and blitz until smooth. 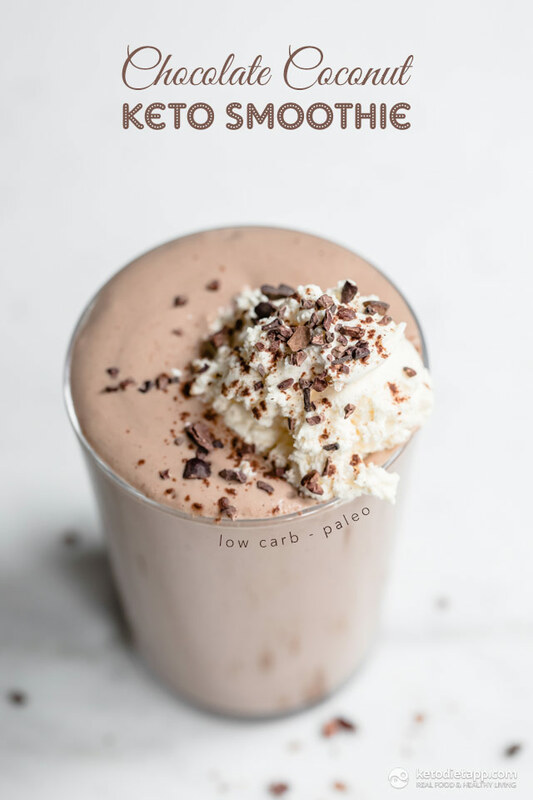 Pour the fat burning keto smoothie into a glass and serve. If using whipped cream for topping: Whip the coconut or heavy whipping cream using a hand blender until thick. Optionally, add cocoa nibs or chopped dark chocolate. Best served fresh but can be stored in the fridge for 1 day. OMG! I just made that for lunch. I’m in heaven it’s delicious! It feels a bit naughty but nice. I’m still confused!-.. so the 1/4c coconut cream called for in the smoothie ingredient list doesn’t go in the smoothie at all? If it does when do you add it? Thanks! Hi Kalsey, you're right - step one is a bit confusing - fixed! All of the ingredients that are listed in the "smoothie" - not listed as extras - go in the blender in step 1  The cream mentioned in step 2 is just an extra for topping. I hope this helps. Hi! Quick question - recipe says to blend (whip) the coconut cream separately. Is this specifically to be used for topping, or do you fold it into the smoothie? I just want to clarify, since optional ingredients suggest whipped cream or whipped coconut cream for topping, but is also called for in regular ingredient list. Thanks so much, looks delicious!! Hello. This recipe suggests adding in collagen as an extra ingredient. I really want to purchase gelatin products to heal my gut but am very confused. There are bone broths, gelatin powders and collagen powders for sale. This recipe links to Great Lakes Gelatin /collagen powder. Is this kind of product as good or the same as a bone broth (such as Best of the Bone Broth)? I assume bone broths would offer more than collagen- is this true? 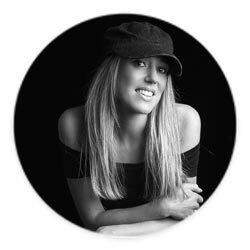 Are there any bone broths you can recommend please? All in all, this a great recipe and I can't wait to try it- thank you! Hi Milly, the best product for this recipe would be collagen powder (collagen peptides) - they type that does not gel when added to liquids. I assume bone broth, including any dehydrated products, would be flavoured (salt, herbs and spices) and likely not suitable for sweet recipes like this one. Great lakes makes a good collagen option, it's the one called hydrolyzed gelatin and it comes in a green package (they also make an orange one that is gelatin - the type that gels). I hope this helps!